These acclaimed essays, broadcast by the BBC as the 1990 Reith Lectures, appear prophetic now. Since that time, the resurgence of religion has caught us by surprise. The influence of the moral majority in the USA, the Islamic Revolution in Iran, the prevalence of religious parties in Israel, the renewed vigour of Catholicism in Europe and Africa, all run contrary to the notion that modernity and secularisation inevitably go hand in hand. Instead, religion has resurfaced and often appears to be not only powerful but menacing and threatening. 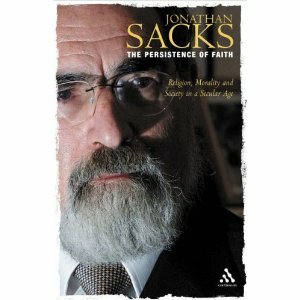 Sacks’ solution is not to drive religion further into retreat. He argues that each faith must remain open to criticism, yet keep alive its separate community and contribute far more rather than less to the mational debate about moral issues. We still live under the Biblical canopy which provides a cohesive morality that can unite the diverse bonds of faith. He makes the case for a return to tradition within the context of religious tolerance. Religious values remain a strong force within our culture to be renewed. For our society to be viable, indeed they must be renewed.